Last week, J.S.Watts appeared on Leigh Chamber's Mid Morning Show on Cambridge 105 to talk about her new novel, "Witchlight". This week, the podcast of Cambridge 105's Best of the Guests from last week includes Leigh Chambers hearing from author JS Watts who chats about her new fantasy and paranormal novel, Witchlight, set in South Cambridgeshire. There are lots of interesting people on this podcast and it is well worth a listen all the way through, but if you want to cut to the chase, you can find J.S. 's section at 1hour, 21minutes and 30 seconds. Go here to listen to all or part of the podcast. Would you like someone to read the first chapter of Witchlight out loud to you? Happens you're in luck. To celebrate the launch of her paranormal novel, Witchlight, J.S.Watts recorded a series of five short videos of her reading the opening chapter of Witchlight. The videos are available for your viewing and listening pleasure on YouTube and to make matters even easier still, they are gathered here together on this post. Well that was the week and what a week it was! The Witchlight blog-tour started here on Goodreads last Saturday. From here we went to Bristol in the UK with Bristol Book Blog (BRSBKBLOG), then to Brook Cottage Books, Portugal with Susan Roebuck, Coffee with friends and Ute Carbone in The States. We stayed in The States For Candy's Raves and Battered Suitcase and now here we are back at Goodreads. We’ve considered how life can change in a moment, what can happen when past and present meet, the delights of cross-genre writing, the writing journey and met two key characters from Witchlight. Even Dickens the cat managed to turn his paw to blogging, (brilliantly, he says) and I got to show you, I hope, my novel Witchlight from many different angles. In the middle of this week’s tour, Witchlight was officially launched in both paperback and e-formats and we managed to party virtually and simultaneously on both sides of the Atlantic thanks to Facebook and the video-link marvels of Google Hangouts. We even managed some giveaways during the party and now there are further Witchlight giveaways over on Susan Roebuck’s website. (Catch them while you can. They finish on 31st May). Oh yes, somewhere in the midst of all that there was a radio interview about Witchlight and an amazing book-launch celebration cake. "if you're looking for a cast of lovely characters, an interesting plot, and the story that will reel you in right from the start, then this is it"
"Not to use a witch term, but I was enchanted by Witchlight. I was a fan of Holly from the first page and the writing kept me interested enough to keep turning the page. I would recommend this book to Paranormal fiction lovers. It's full of witchy goodness, dark and light." "The scenery and characters were brought to life in exquisite detail." "This is paranormal at its best, what a truly well written, informative, extraordinary book." "Witchlight is a great read"
Present and past come together in a variety of ways today. In the immediate present, the seventh and penultimate blog post in the week-long Witchlight Blog-Tour has been published. 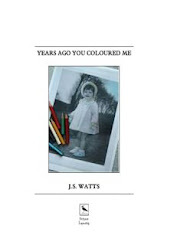 The Battered Suitcase Press Blog is kindly hosting J.S.Watts' contemplations on the subject of present and past. In the recent past, author Susan Roebuck hosted the fourth blog post in the Witchlight Blog Tour, Travelling Across and Up and Down The Page. Susan's own novel, Rising Tide, has also been launched this week and to celebrate the launch of both Witchlight and Rising Tide there is an opportunity to enter a free online raffle giveaway to win copies of the books. The rafflecopter event begins tomorrow (which is in the future at the time of writing this) and runs until 31st May. See Susan's website and blog for further details. I am really pleased that this current stage of the blog tour celebrating the May launch of my paranormal novel, “Witchlight”, is being hosted by the Battered Suitcase Press blog of my publisher, Vagabondage Press. I love the way present and past so often come together, sometimes positively, sometimes not, but inevitably in an intriguing and fascinating way. Two sections of existence’s timeline, separated by months, decades or centuries, but influencing one another and combining to create and shape new events and occurrences. Writing, whether a letter, a blog post or a novel, is a way of capturing the present and fixing it so that, however long ago something was written, it will always seem the present for someone reading it for the first time. My present thanks to Vagabondage for their past efforts will be available for you to read in your present for as long as this blog remains on line, even when this moment, as I am experiencing it, has long since faded into the past. The eighth and final post of the tour will be published tomorrow, when we return to J.S. 's Goodreads Blog, the starting point of the tour a week ago. 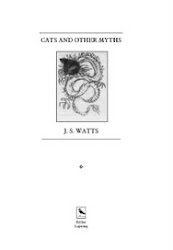 J.S.Watts was unavoidably called away from her computer when the sixth blog post in the Witchlight blog-tour was due to go live. Fortunately a rather special blogger stepped in to the breach to save J.S. and thus the sixth blog post has been published on Candy's Raves on the agreed date. 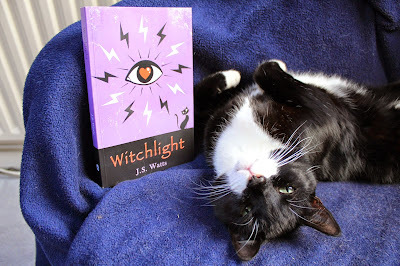 My human, who writes as J.S.Watts (though I just call her Yiaow), is having a busy time writing posts for the blog tour to promote her new novel, “Witchlight”. Yesterday I tried to help by bringing her a delicately chewed mouse. For some reason, she didn’t seem to appreciate the gesture. Today, I’m going to try a different approach and write a blog post for her while she’s out buying carpet cleaner. She’s bound to be grateful. Before we get much further in to this post, though, I’ve got to say that I don’t think much of the accuracy of its title. Cats have witches. Witches don’t, per se, have cats, in the same way that humans don’t have cats. Though, of course, according to Yiaow’s novel, witches are humans born with the “abracadabra gene”, so it’s all a bit complicated. Oh well, I guess it gives me the opportunity to tell you about the most important character in her new novel, Barny the cat (though I do feel she should have given him a properly respectful feline name). First, however, and to put important things into context, I need to tell you about me. I was only a kitten when I chose Yiaow for myself from amongst the supply of human helpers I was proffered at my temporary residence. Even as a youngster I could detect talent. I don’t mean she’s a good writer, I have no idea, but I knew she was right for me and, if she was going to waste time writing, at least she would be writing about appropriate things. Yiaow proved her worth and my judgement almost immediately by incorporating me into several of her poems. 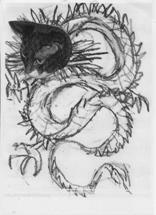 When she picked the one I thought did me most justice, “Cats and Other Mythical Creatures”, to be the almost title poem of her poetry collection, “Cats and Other Myths”, I knew I was in the cat-as-muse stage of my career. even with the help of a human friend, she couldn’t capture the image exactly as she wanted it. I just sashayed up to her and pointed out that a photograph of me was what the image needed and everything was concluded most satisfactorily. This was the cover-model stage of my career. Then she wrote me a walk-on part in her novel, “A Darker Moon”. Technically the role was for a female kitten, but in written fiction anything is possible and the little black and white Evie wrung hearts during her brief scene. The seventh post of the tour called "Past and Present" is due to be published on Friday on the Battered Suitcase Blog and J.S.Watts will be back in her writing chair.. The fifth blog post in the week-long Witchlight Blog Tour has been published. 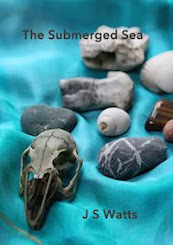 Goodreads author Ute Carbone has generously hosted it on her website. Thank you, Ute. I’m over the moon that the wonderfully generous Ute Carbone has invited me back to her superb blog to talk about (or should that be write about?) my new paranormal novel, Witchlight. Witchlight is being published this week by Vagabondage Press in both paperback and e-format and Ute’s kind invitation provides me with a brilliant opportunity to introduce you to my novel’s lead character, Holly Jepps. I become very attached to all my characters, but there’s something about Holly that has made her especially special to me and I hope readers of Witchlight are going to like her as much as I do. Witchlight is a paranormal tale, with a touch of romance. Like Harry Potter, Holly discovers she has previously unknown magic powers, but as she is thirty-eight rather than eleven, all similarities end there. Holly lives on her own with her much-loved pet cat, Barny. She’s a talented personal counsellor, hasn’t had a smooth-run, romantically speaking, and leads a normal, unexceptional life, until one day, and without warning, her fairy godfather turns up to tell her that she’s a witch with inherited magic powers. Needless to say, this comes as something of a shock to Holly, who suddenly has a lot of adjusting to do. The sixth post of the tour is due to be published on Thursday on the Candy Raves website. It's called "The Witch's Cat" and it has been written by a very special blogger. Today is the official launch day of J.S.Watts' new novel Witchlight in paperback and e-versions. The online launch party is taking place this evening (UK time) and the fourth of her blog posts in the week-long Witchlight blog tour has been published. Author Susan Roebuck has generously hosted it and has also published a wonderfully positive review of Witchlight at the same time. The post is called "Travelling Across and Up and Down the Page" and a little flavour of it is provided here, but you really need to go to Susan's Blog to read the entire piece and her wonderful review of Witchlight. When Susan generously invited me to write a guest post for this blog I naturally asked if there was a particular subject she’d like me to write about. “How about your journey to date as a writer?” Fair enough, I thought and so here I am, pen in hand (I invariably write first drafts of anything long hand), wondering where I should begin this summary of what is, in effect, a lifetime’s journey. I’ve always been an avid reader and writer. I used to say that my earliest significant writing moment was when I was roughly seven or eight and a poem I had written was placed (second, I think, but I may be wrong) in a cross-borough poetry competition. My mother, however, claims to have physical proof that my first poetry success was at the earlier age of four or five, when a poem I wrote about the beauty of nature was one of two chosen to be read out in school morning assembly. Apparently, for blackmail purposes, she has the original poem in question written in my infant scrawl. Needless to say, I wrote a number of poems and short stories (and a play, if I remember correctly) during my school days and some even won some prizes. There was a brief lull in my writing activity when I went to university and the pressure of late night essay crises and analysing others’ writing won out over my own creative processes. By the time I graduated, however, my writing was once more on the up and I was back to writing poetry again. Wednesday's post (the fifth in the Witchlight Blog Tour) will be hosted by author Ute Carbone over at her blog, Coffee With Friends: http://www.utecarbone.com/coffee-with... It will be a wonderful opportunity for people to get to meet Holly, the lead character of Witchhlight. 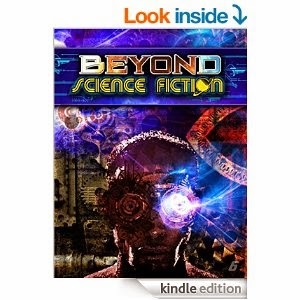 As a reader, I enjoy reading genre books of all varieties, but I always get a little thrill when I come across a book that strays beyond traditional genre boundaries, or merges two or more genres. Margaret Atwood’s wonderful novel “Alias Grace” comes to mind: a book that simultaneously manages to be historical fiction, literary fiction, a mystery novel and an insightful piece of writing on human romantic and sexual relationships. Or there is Marcus Zusak’s “The Book Thief”, with its blend of history, emotion and magical-realism. It keeps me, the reader, on my toes, makes me think harder and often manages to deliver the unexpected. As a writer, therefore, it is perhaps not surprising that my writing tends to be somewhat fluid when it comes to genre boundaries. For example, my poetry, whilst literary in style, frequently has mythical or science fiction themes. My short stories often straddle two or more genres: fantasy and horror, horror and crime, science fiction and fantasy, fantasy and literary fiction, and my first novel, “A Darker Moon” has variously been described as horror, gothic romance, dark fantasy, mythical fantasy, magic-realism, literary fiction and dark fiction. At least everyone agrees that it is dark. I guess I write what I want to read and try not to limit myself to pre-imagined boundaries. Tuesday's post (the fourth in the Witchlight Blog Tour) will be hosted by the author Susan Roebuck over at her blog http://www.susanroebuck.com/index.html. Tuesday is, of course, the day that Witchlight is officially launched in paperback and e-editions, so there may well be some books up for grabs on Susan's blog! There is also, of course, the online launch party to look forward to on Tuesday as well. It's going to be a busy, but very exciting day. I was about to write that there are two things which fascinate me, but that would be wrong. Many, many things fascinate me and find their way into my writing, but for the purposes of this post there are two things I am going to focus on: the way life can change (for better or worse) in a moment (a blink of an eye, a beat of a heart, the ring of a phone, the ping of an email) and how the things that fascinate me in life invariably end up in my writing, even though my life is pretty mundane and I frequently write about fantasy, science fiction and horror. So there I was today, working away at something I had planned to do (I have quite a lot on my to do list at present. My new paranormal novel Witchlight comes out in paperback and e-book formats on 19th May) and suddenly my email pings and there is a message from my publisher saying there’s a last minute opportunity to do a guest post to help with the promotion of Witchlight. Will I respond to it? Of course I will. I’ve committed months of my life and untold emotion to the creation of my new book and I want to do right by it and the characters I have created: see it, and them, on their way out into the big bad and uncertain world as best I can. Then I realise that the deadline is very, very close. The piece has to be submitted before 1st May and today is the last day of April and it’s already almost 5pm. I have less than seven hours in which to write this piece and submit it, cook and eat some dinner, go to Thursday band practice (I’m a French Horn player and no, don’t ask), finish what I am currently working on, sort out the cat, prepare for tomorrow’s three back to back events and go to bed at a reasonable time because I’m up early tomorrow morning. So here I now am, at my keyboard, original work on hold, this evening’s plans interestingly shaken up in the cocktail mixer of life (and no, I doubt that I’ll have time for a real cocktail when 6pm comes round) typing away at this piece. Half a day of plans thrown up in the air at the ping of an email. "Welcome to the first post of the trans-Atlantic Witchlight blog-tour. If you have been anywhere near my website or Facebook page (or my Goodreads profile, or anyone that’s read one of the special pre-release e-copies, or indeed just me) you will have probably realised that I have a shiny new novel coming out on Tuesday 19th May. It’s called Witchlight. It’s a paranormal story of witchcraft and witchery and it’s going to be available in both the UK and the US in paperback and e-formats from my publisher, Vagabondage Press (and Amazon, and Barnes and Noble, and ibooks and…and…). Needless to say, I’m very excited. Much of my excitement will inevitably be unleashed at the online launch party that’s taking place on 19th May via Facebook, but before then, and starting with this post, there is an eight day blog tour to promote the novel. Various kind and generous people have agreed to publish an assortment of guest posts from me, each one exploring a different aspect of Witchlight and my writing. The itinerary for the tour has already been published on this blog and on my website here, but you may want to note that the post on Goodreads author Sue Roebuck’s blog, scheduled for launch day itself, will involve a giveaway or two. Similarly, there will probably be some prizes on offer during the online launch party and, if that isn’t exciting enough, e-copies of Witchlight are currently available at an extra special pre-launch sale price (get your copy before 19th May). Witchlight has been described as “Harry Potter for grown ups, with all the magic and all the humor, plus a cocktail hour and some romantic intrigue. J.S. 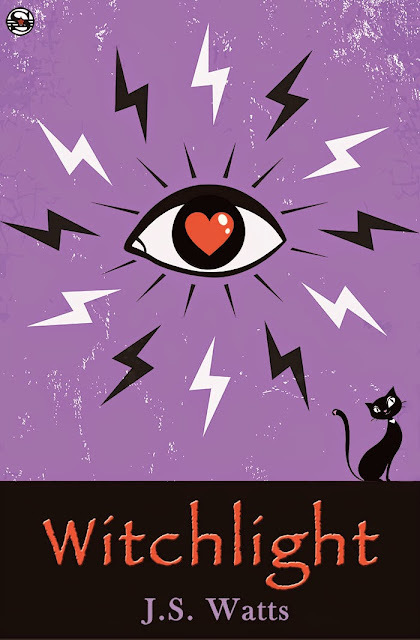 Watts' lyrical prose, British wit, and irrepressible protagonist make WITCHLIGHT a rollicking read”. It’s a wonderful (and generous) summary, but it is just that – a summary. In their way, the guest posts on the blog tour are all summaries as well, snapshots of Witchlight in different poses, but I’m hoping that the accumulated impact of the blog tour will provide people with a real taste of Witchlight as a whole, as well as my growing excitement, which I really am having difficulty controlling. Then again, I’m the author. The book’s my baby. I’m allowed to be excited. I would love it, though, if you could come to share my excitement with me. 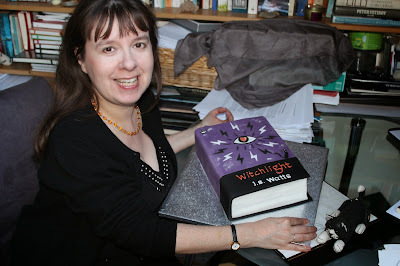 The second post of the tour is called "A Moment of Change" and will be posted tomorrow, 17th May, on The Bristol Book Blog, otherwise known as BRSBKBLOG, which you can find at http://brsbkblog.blogspot.co.uk "
To celebrate the official launch of her new paranormal novel, "Witchlight", on 19th May, J.S.Watts is embarking on a week-long, non-stop, whistle-tooting blog tour across the UK and the States, starting on Saturday 16th May and finishing on Saturday 23rd May. Links to each blog post will be published on this website on as near to a daily basis as can be managed, so please do start checking back from 16th May onwards to join the Witchlight Blog Tour. 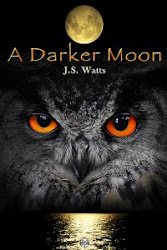 Over on Pretty Hot.com J.S.Watts has been gently grilled about her forthcoming paranormal novel "Witchlight", which is being officially launched in paperback and e-book formats on the 19th of this month! 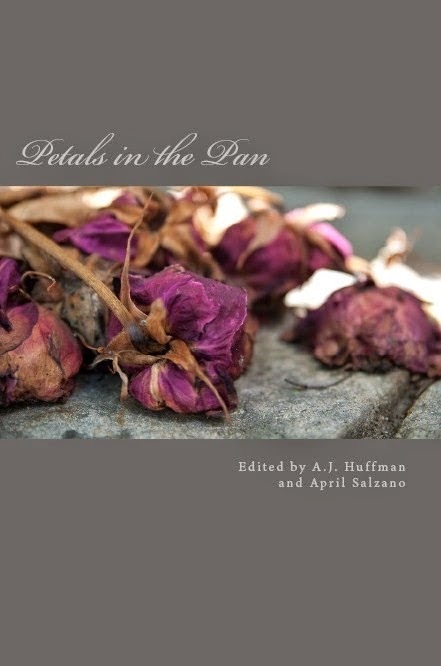 Kind of A Hurricane Press has announced the publication of its first 2015 anthology, "Petals in the Pan", poems of blossoming and dust, including "Empty Promises Rattle Like Gourds", a new poem by J.S.Watts. The paperback can be bought from Amazon or you can download the ebook for free via Kind of A Hurricane Press's bookstore. No apologies will be made for this - the month of May is going to be all about the Witchlight. J.S.Watts' new paranormal novel "Witchlight" is officially launched in paperback and e-book formats on 19th May and in the lead up to the launch everyone is getting very excited. There is going to be an online launch party on the day between 6pm and midnight (UK time) and J.S. Watts is embarking on a week long blog tour to celebrate the launch. More details of the tour will follow shortly. Please check back for further updates as we draw nearer to the source of the witchlight. J.S.Watts has a dark, new piece of Flash Fiction in this month's issue of Beyond Science Fiction. So if you want to know what happens in The Village of Hellend, you are going to have to buy a copy!